Most of the diet for chameleons is made up of insects. They are insectivorous animals that by a large extent hunt the insects. Therefore, having a chameleon means that you should always provide it with the insects to feed on. It can feed on insects like roaches, meal worms and crickets among others. It is easy to get insects at an affordable price from the pet stores for your chameleon. The pet’s diet should have a variety of ingredients. Therefore, providing wax or even silkworms to the chameleon once in a while boost the nutritional content of the foods hence providing a balanced diet to your pet. 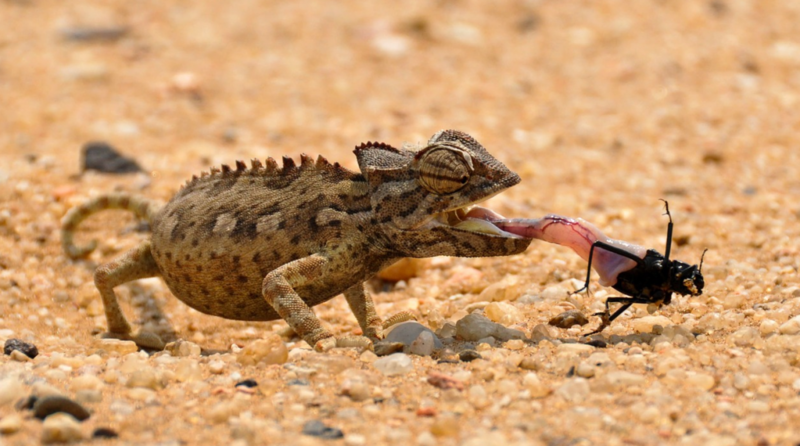 Nonetheless, often feeding chameleons with worms is not advisable since worms have a lot of fats. Gut loading your insects before feeding them to the chameleon is advised since it provides the nutrients and vitamins required for the pet’s growth and development as well as for its good health. In addition to feeding on the insects, some varieties of chameleons such as the veiled variety once in a while feed on the plants. Therefore if you decide to use live plants in the habitat or for feeding them, the plants should not be toxic. This ensures that they boost their nutritional content for the best results. Prepping of the plant before introducing it into the habitat is essential. This is because most of these plats have always been introduced to pesticides hence they carry a lot of toxins that can be detrimental to the health and survival of your chameleon. The plants, fruits as well as vegetables that are used to gut load the insects can as well be directly provided to the chameleon for feeding. Chameleons that are fun of feeding on plants should be fed on berries, sliced vegetables, fruits, leafy greens, collard and kales among others. Chopping the plant into bits that are easy for the chameleon to chew is relevant. Giving the chameleon substances that are larger than the cavity existing amid its eyes is not advisable. Larger chameleons have mice as their source of nutrients. Therefore, adding mice to the nutritional content prepared for the chameleon is relevant. Mice are a rich source of nutrients and vitamins that are highly required by the chameleon for growth. An occasional feeding of mice is however advised since most of the mice have a lot of fats. Diets that have a lot of fats are not good for the chameleons and should be taken once in a while. If providing mice to the chameleon is not easy for you, you should never worry since the chameleon can survive without them. However, providing the pet with mice once or twice a month is very essential. Mice that have been pre-killed are available for the pets in the pets’ stores. Those that are frozen can be stored for long periods of time and can easily be thawed using warm water when you need to feed your pet. Once you have acquired your own pet chameleon, the art of feeding it becomes entertaining. However, you should know the right nutrition for the chameleon and how to feed them. You do not have to worry about the type of meals that your pet will have. This article has evaluated the best diet for your chameleon. You only have to choose what to provide to the pet and acquire it form the natural environment or even from the pet stores. Once you do this, your chameleon remains healthy and happy always.